is one the the most popular short high altitude trekking destination in sikkim. 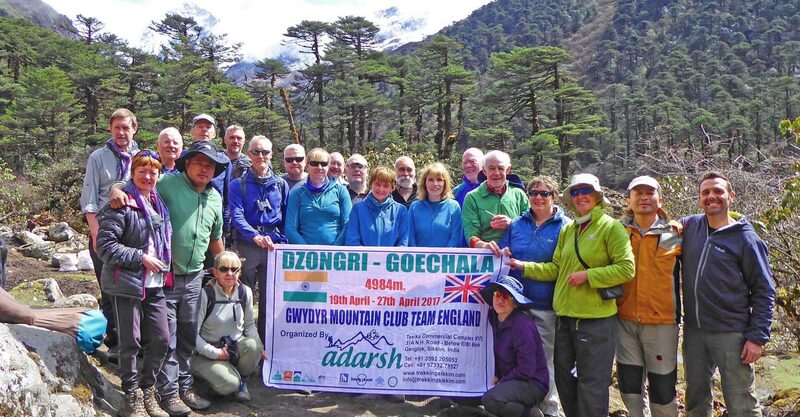 Dzongri trek is a shorter version of the Goechala Trek. Namaste !! Khamri !! Tashi Deley !! 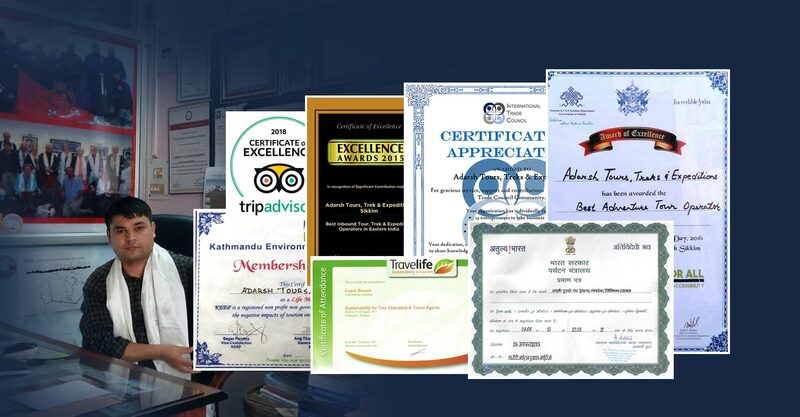 Adarsh Tours and Travels, with traditional Sikkimese hospitality, ensures a complete holiday experience to suit the requirements of an individual or a group. We offer the best and most personalized services. When you come withus, all services are included, leaving you free to enjoy the beauty around you and respond to the warmth of people who have not forgotten to maintain the integrity of our natural environment. Relax and give yourself time to enjoy a unique holiday with us. Our team shares a concern over the environment impacts of mountain tourism - and we Gangtok endeavor in promoting quality responsible tourism. Our concern for the environment stems from the fact that we live here among the mountains and our livelihood depends on the balance of the delicate. 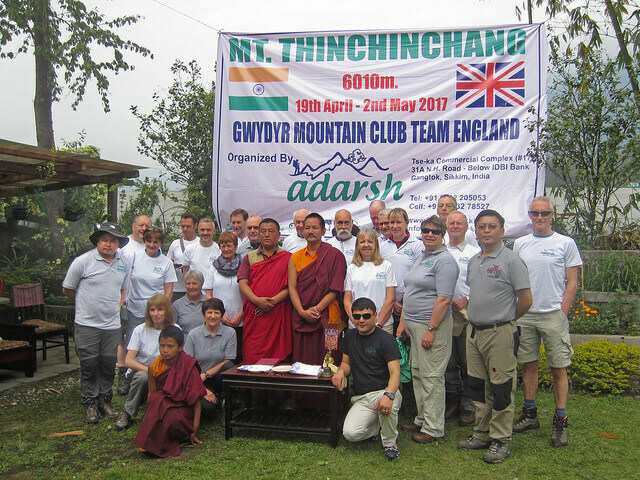 Sikkim - Cultural Tour "
Sikkim - Monastic Tour "
Warm Greetings From Adarsh Team Sikkim. At The Outset Would Like To Thank You For Referring Us For Smooth Ground Handling & Logistic Support In Our Areas Of Operation. 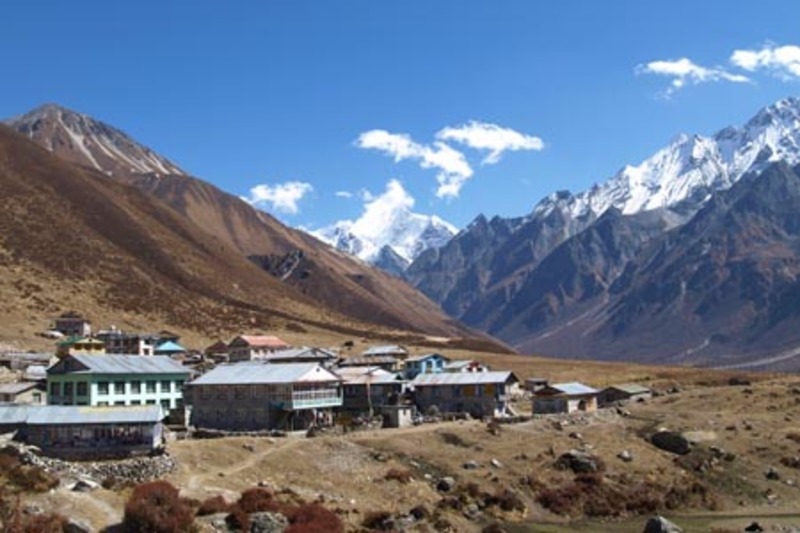 Himalayan Heritage Trek is popular low altitude village to village trek in Sikkim. This Low Altitude trek is specially customized for those Adventure Lover who loves to be with the Nature and Himalayan but at the same time want to avoid higher altitude gain. 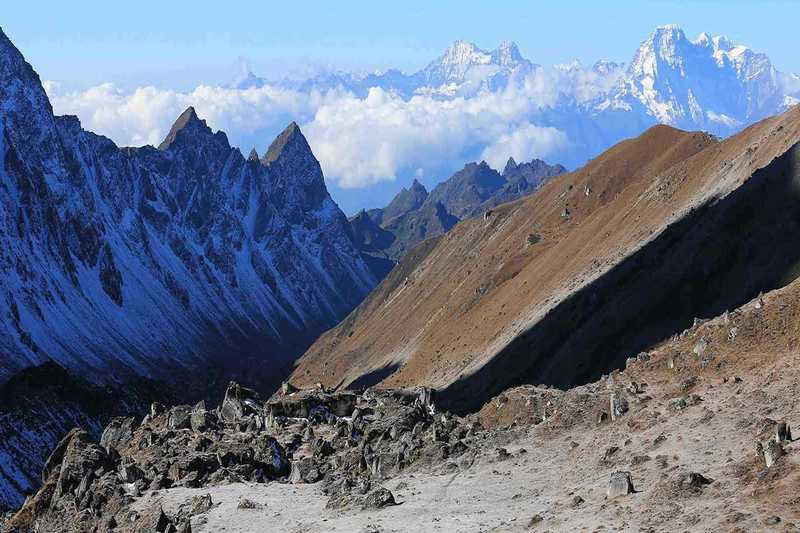 Yuksom Dzongri Trek is one the the most popular short high altitude trekking destination in sikkim. 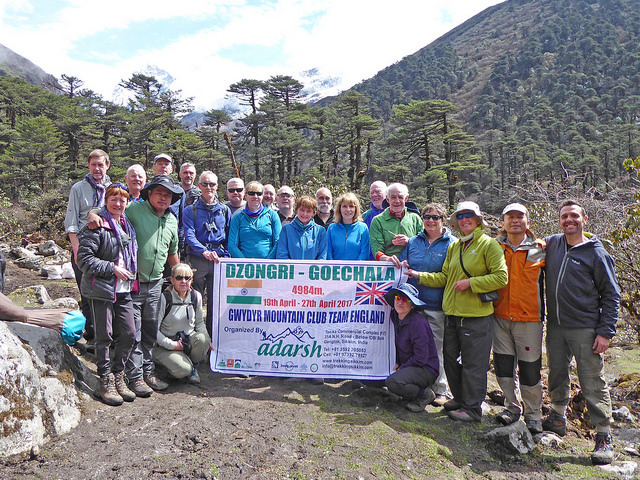 Dzongri trek is a shorter version of the Goechala Trek. This particular trek starts from Yuksam and ends up at Yuksam in 6 days. 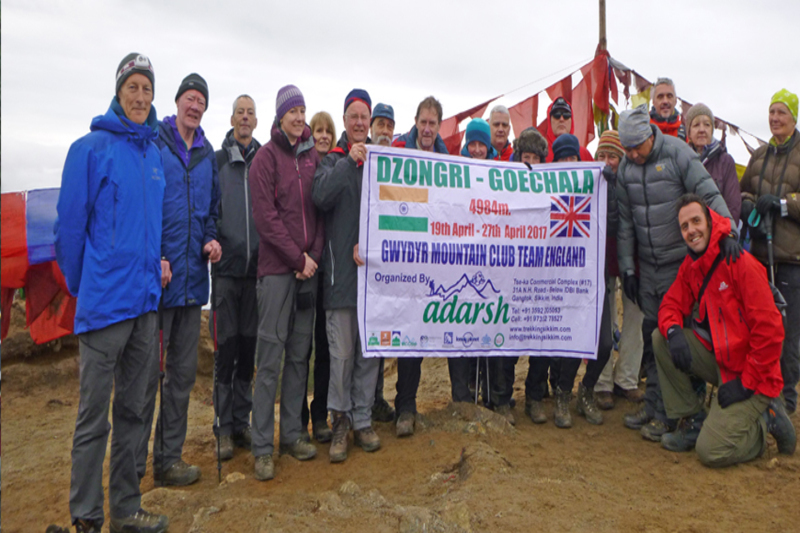 Dzongri trek is specially suitable and designed for the trekkers who wanted to explore more in shorter period of time. 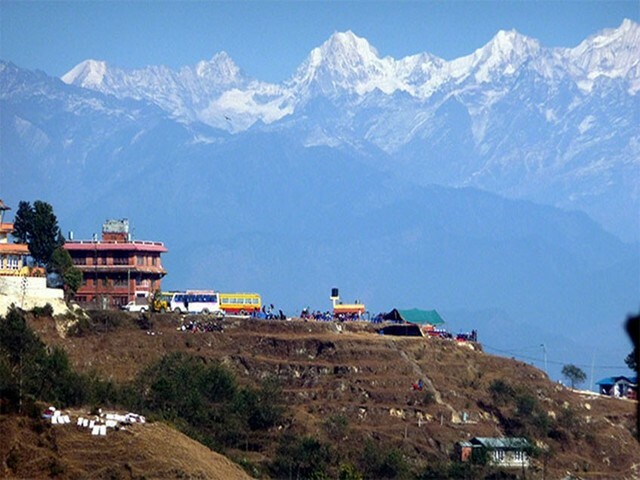 In fact Dzongri and Dzongri La (view point) is the best spot for a view of the mountains and its ranges in the sikkim himlayas. Along with Mighty Mt. Kanchendzonga 8585m - The third highest mountains in the world, some of the most well know peaks seen during this trek from Dzongri View Points are Mt. Pandim 6691m, Mt. Kabur north 7338m, Mt. Kabur south 7317m, Mt. Kumbhakarna (Janoo) 7710m, Mt. Simvo 6811m, Mt. Kabru Forked 6108m, Mt, Frey Peak 5830m, Mt. Rathong 6679m, Mt. Kokthang 6147m and Mt. Goecha Peak 5127m. 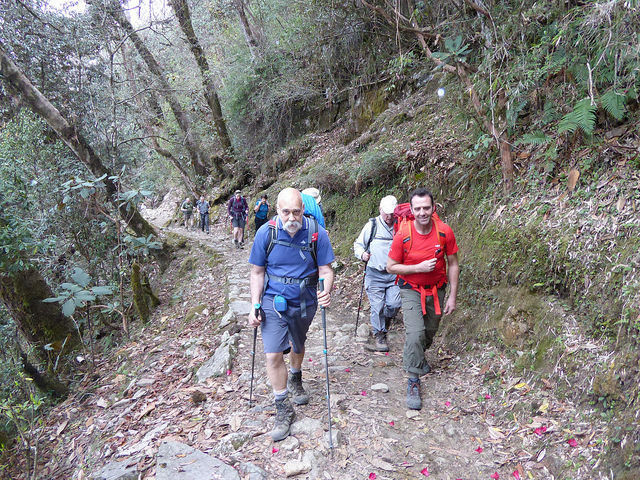 Sikkim -Darjeeling Trek & Tour"
Goechala trek is the premier and the most well known trekking trail in Sikkim. This trek takes the trekkers upclose for a spectacular view of the mighty Mt. Kanchendzonga 8585m - the third mountain in the world along with several other towering snow capped mountains. Some of the most well know peaks seen during this trek are Mt. Pandim 6691m, Mt. Kabur north 7338m, Mt. Kabur south 7317m, Mt. Kumbhakarna (Janoo) 7710m, Mt. Simvo 6811m, Mt. Kabru Forked 6108m, Mt, Frey Peak 5830m, Mt. Rathong 6679m, Mt. Kokthang 6147m and Mt. Goecha Peak 5127m. Goechala trek is an extension of the Dzongri trek. Trekking beyond the meadows of Dzongri is a raw adventure at its best where the visitor is taken into the realm of towering mountain peaks and unspoiled nature. During Goechala trek the spectacular landscape of nature will make one find inner peace and one will start appreciating the beauty of the Nature and God's creation. 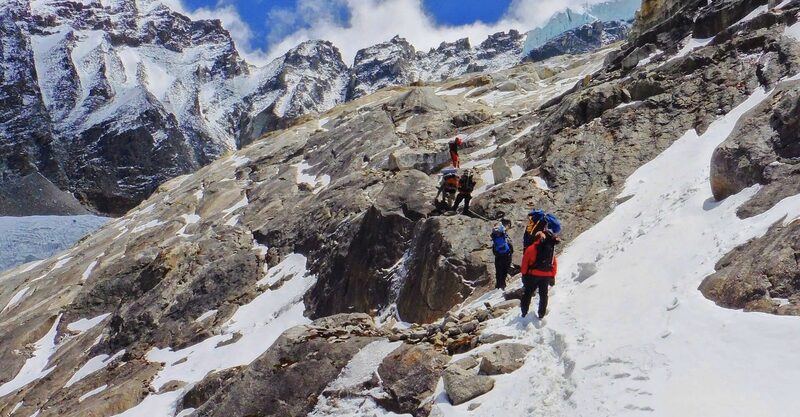 Brumkhangse Peak Climbing Positioned at the imposing and surreal location of North Sikkim, Brumkhangse Peak has been opened for expedition since 2005. It is a moderate grade of trek that is isolated from other major peaks of Sikkim. The excursion passes through the exquisite valley of Lachung. In addition to this, one can also relish the vistas of splendid and breathtaking peaks such as Eagle Peak, Pheling Peak, etc. The trekkers can drench themselves in the opulence of nature with enjoying the vistas of absorbing panorama. The intact beauty of the trail can simply spellbind the travelers in no time. This 12 nights and 13 days itinerary take travellers to Brumkhangse Peak along with the other mesmerizing regions such as Lachung, Gangtok, etc. This tour is ideal for all those who want to exhilarate their nerves while relishing stunning landscapes. Annapurna Base Camp Trekking Annapurna "Deothali" as the place is known to the "Nepalese" is considered sacred, though there is no documentation to show how long this state of affair has prevailed. It's however, certain that it was so, long before the first trekkers appeared. The Annapurna Sanctuary forms a natural amphitheater ringed by Annapurna South and I, Varahashikhar, Gangapurna and Machhapuchhare or "Fish Tail" as it is commonly known. The Sanctuary fall within the area managed by the Annapurna Conservation Area Project and is an exercise in environmental and cultural protection accommodating the needs of both the visitors and the local inhabitants. 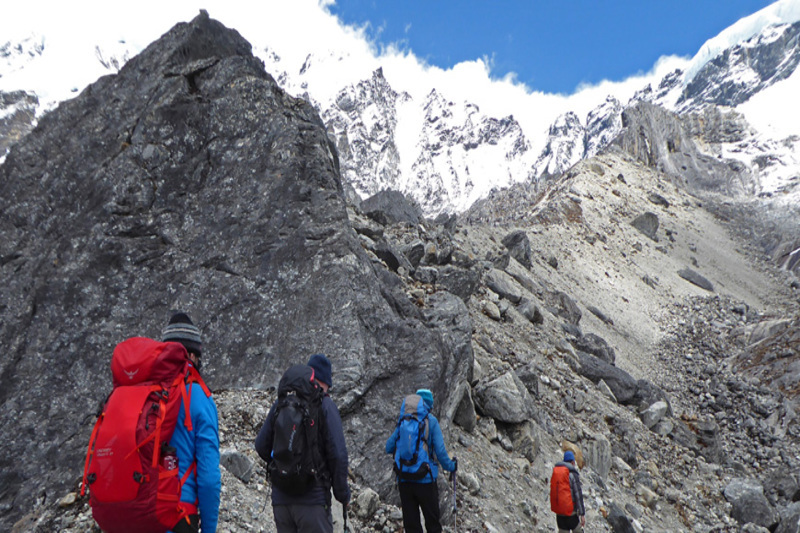 There is a good mix of high mountains and Himalayan culture on this trek. The Annapurna Himal lies between the Kali Gandaki and Marsyangdi river valley, forming a solid, mountain bastion. Within its span of 40 miles, it encompasses some twelve peaks that are higher than 7,000 m. and numerous others over 6,000 m. As rhododendron forests give way to bamboo groves, which in turn vanish into the high, desert landscapes, people of Aryan stock give way to those of Mongoloid stock and the dominant religion changes from Hinduism in the lower reaches to Buddhism higher up. Darjeeling & Sikkim - Kanchenjunga Trek"
From Darjeeling hills where tea plantations stretch as far as the eye can see, to Sikkim, an ancient Himalayan kingdom of Tibetan culture, this trek offers breath-taking views of the Himalayan range from Cho Oyo to Kanchenjunga. The Singalila range is one of the rare spots on earth where the view embraces five summits rising above 8000m, amongst them Everest, Makalu and Lhotse. On these 19th century English Lords trails, you will trek on easy narrow paths along the Indo-Nepali border, sometimes at the edge of the jungle, sometimes through rhododendron forests. Sikkim - Singalila Chiwa Bhanjyang Trek"
This recently opened trek route encompasses the area southwest of Dzongri and as defined by it’s name, includes several days of hike traversing the Singalila Range, the lesser mountain chain that rises from the northern hills of Darjeeling District and extends to converge with the Khangchendzonga or (Kanchenjunga) massif. The Singalila is also the divide that demarcates the western borders of Sikkim and Darjeeling with Nepal. As one traverses this razor-edged borderline ridge, spectacular views abound on both sides with rare species of rhododendron in bloom (at the right season), and an occasional herd of yaks with its herder will be your only source of contact with civilization for quite a number of days. Sikkim - Kasturi Labdang Trek"
Goechala Kasturi Trek is a slighty different version of the Regular Goechala trek. Goechala Kasturi trek is also know as the Round trek or Kasturi Orar trek. This particular trek starts from Yuksam and ends up at Tashiding village. Kasturi trek passes through famous Dzongri view point and Goechala view point and divert itself from the regular Goechala trails from Thangshing on the way back. This treks provides specticular views of the snow capped peaks and mountains range and falls exactly opposite to the Singalila mountain range. The views are simply Amazing an captivating during this trek and are less explored by the trekkers each years. This trek is specially suitable for the trekkers who loves to explore less explored regions, face challanges and like to be with raw nature for bit longer period of time. In view of the prevailing setback on the established Singalila Trek route, a new itinerary has been designed to allow visitors entry into the areas of the region that are still open to trekkers. On taking the trail from the western flanks of Dzongri, the path reaches out into the current permissible areas of the Singalila Ridge. 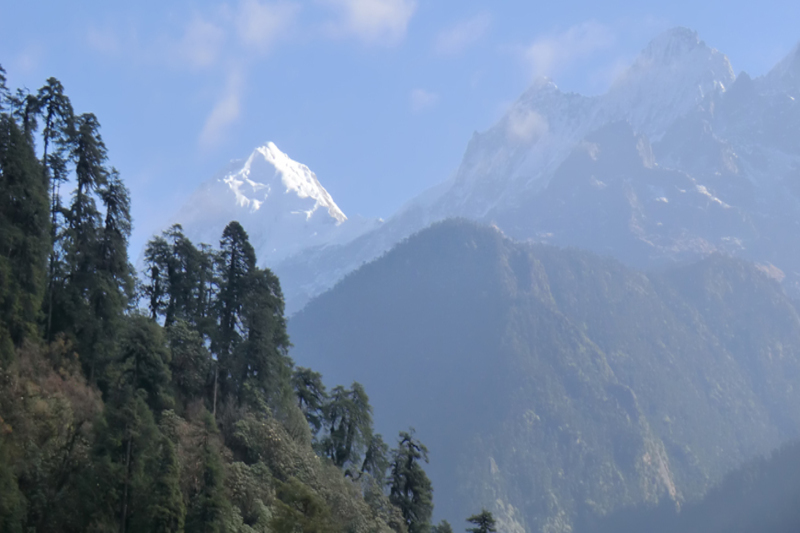 For most parts of the trek, the trails are well within Sikkim with an exception on the seventh day when camp is set in Garakhet (very near the Nepal border). This will also be the day for exceptional views. 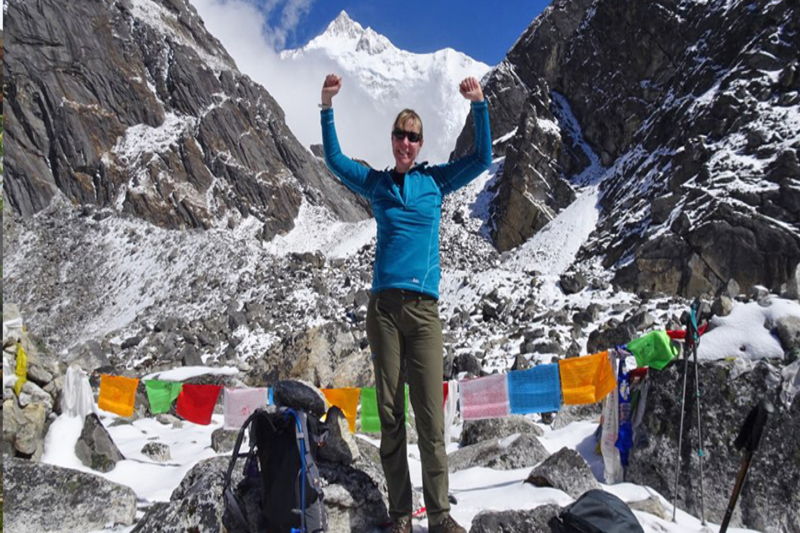 As such, your program includes several hours of forays into the borderline providing the opportunity for great views of the Himalayan giants in Nepal such as Mount Everest, Mount Makalu and Kumbakarna. 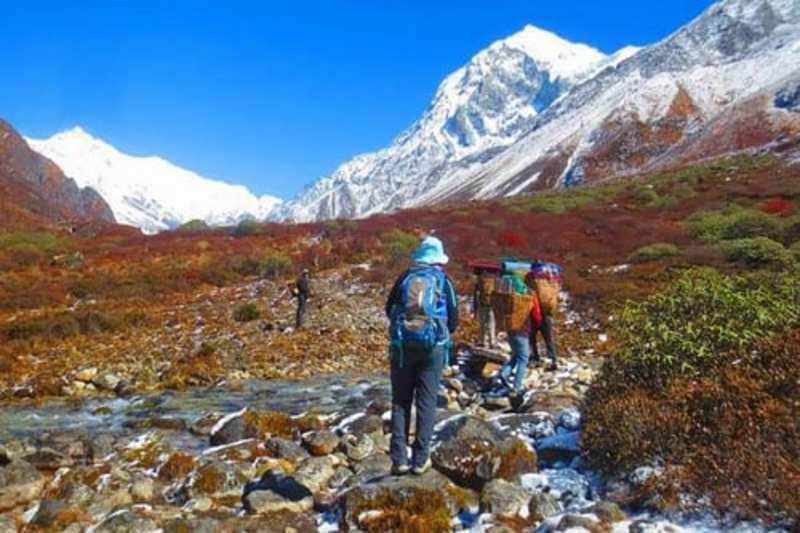 Yuksom - Dzongri - Goechala Trek"
This popular trek in Sikkim, is from Yuksom to Dzongri and onwards to Goecha La, and has superb views of Kanchenjunga. From Yuksam, the trail follows the Rathong Valley to Bakkhim and from here a steep ascent to the village of Tshoka. Above Tshoka the trail reaches Phedang. A further stage brings you to Dzongri (4020 M). From here the trail drops steeply down the river to Thangsing (3930 M). Dzongri is situated at an altitude of about 4020 M, in west Sikkim. It offers the trekker a most fascinating close-up view of Kanchenjunga and Mt. 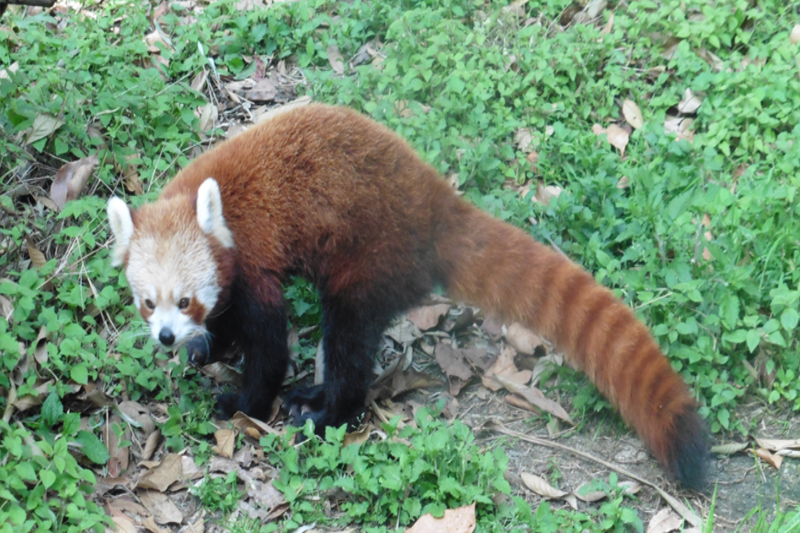 Pandim. To the west rises the long outline of the Kyangla ridge. Dzongri is trekker's paradise. Goecha La is situated at an altitude of about 4940 M. Goecha La offers a mind catching sight of the mountains like Pandim, Kanchenjunga and the others. The trek to Goecha la really is getting out & getting trekked. There are only few trekking routes around the Kanchenjunga National Park that are open to visitors. The trek is traditional which follows a picturesque route past lush vegetation and wonderful mountain views until it reaches a high pass. 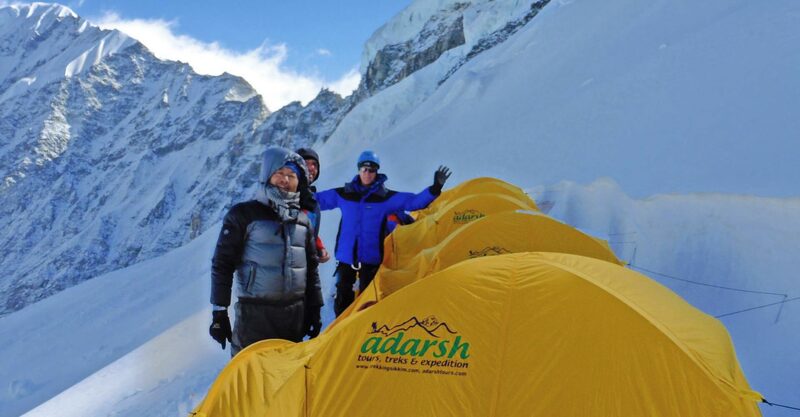 The training courses of the Himalayan Mountaineering. 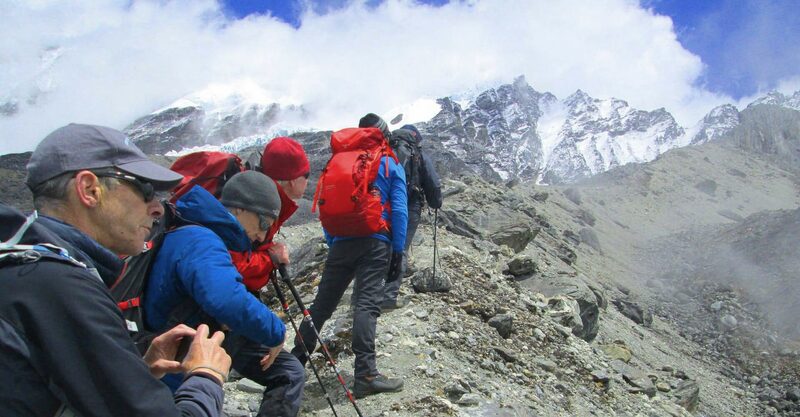 Trekking in Everest,Everest Panorama Trek"
It is alternative route to taking flight to Lukla. Jiri can be reached by drive from Kathmandu. 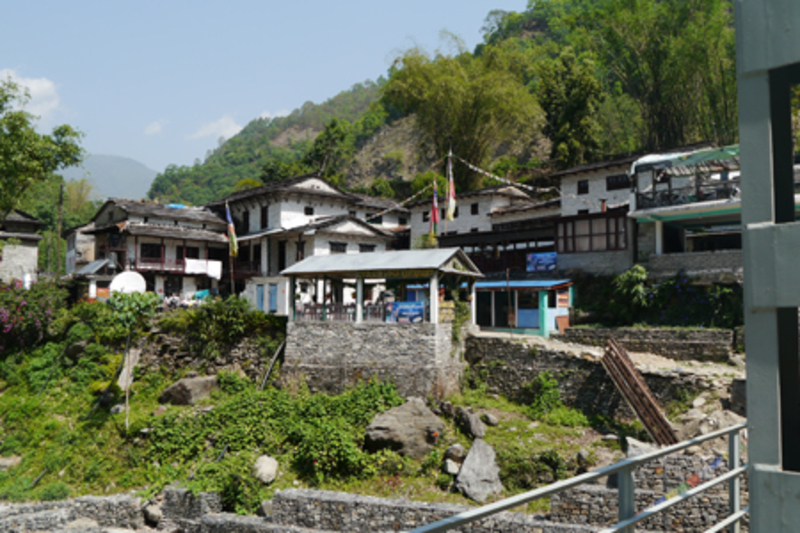 To trek from Jiri gives you good preparation for the Everest base camp trek. It is never flat as it crosses the grain of the land for the first five days. Lamjura La pass 3,530 m. is the highest access of this trek just before Lukla, which bestows magnificent display of pink and iliac rhododendron in spring. The trek passes through Solukhumbu (before Lukla) that are relatively undeveloped compared with the northern part of the region. 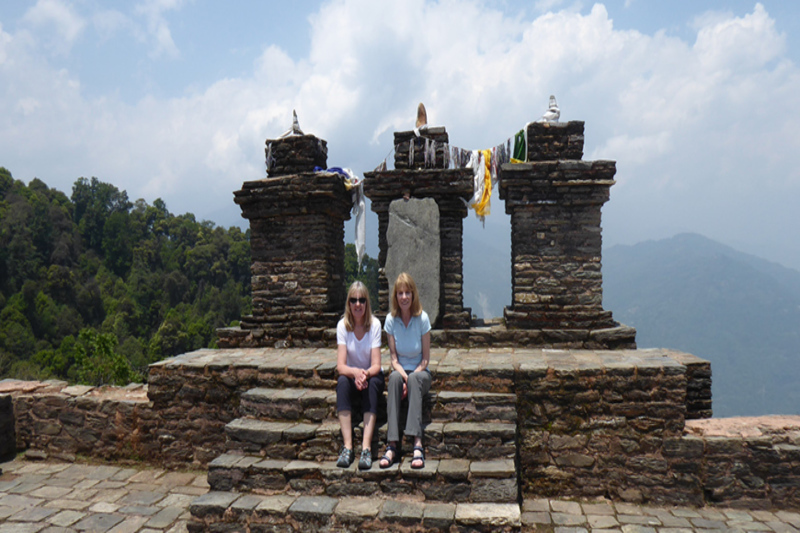 This facilitates trekkers to experience many traditional aspects of the culture of the local people. 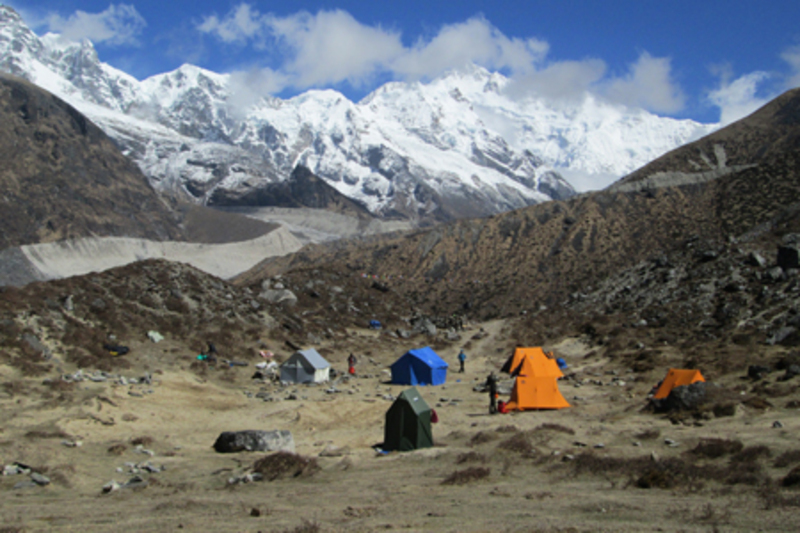 Langtang Valley Trekking This trek is considered as a non-technical trek and suitable for average people. If you are moderately fit and have a sense of adventure you will enjoy this trek. The program is designed to acclimatize you gradually and not to experience high altitude sickness. However you are requested to check your altitude fitness and the itinerary. We suggest you to strengthen your knee muscles and prepare for several days of steep descents. Some physical fitness programs such as running, swimming, biking or aerobics is recommended, but mostly hiking on steep hills or running up and down steps are preferable. 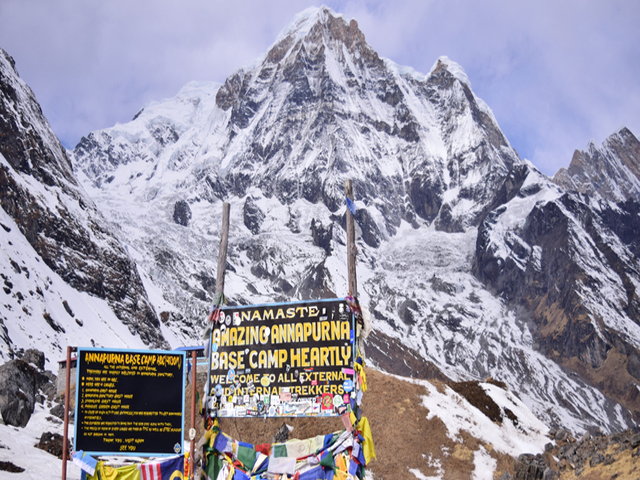 Makalu Base Camp Trekking Makalu (8,481 m.) the fifth highest mountain of the world lying on the Nepal-Tibet border has the virtue of observing the Nepal's most major peaks to the east of the Everest. The trek starts right from the Arun Valley. This region, considered as one of the non-tourist areas has a wonderful charm to explore and always done with a well-supervised and guided group with sensible equipment. 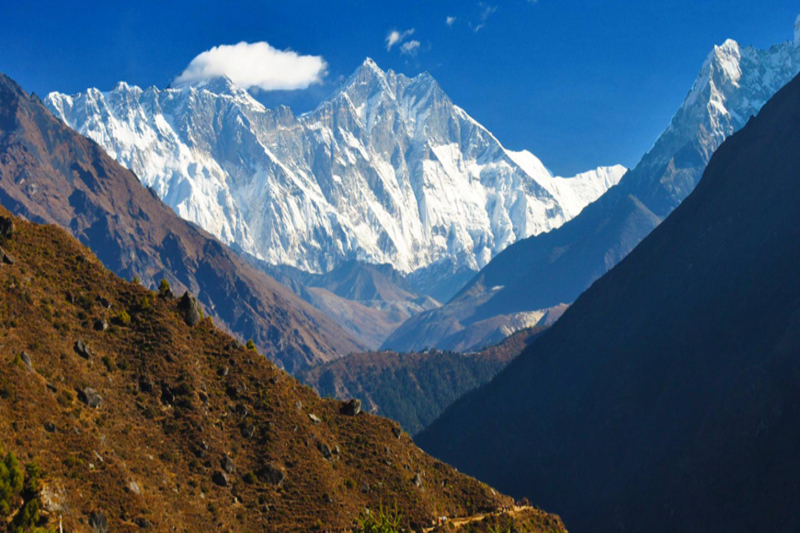 Kanchenjunga Trekking Kanchenjunga is the third highest of the world’s peaks and one of the most remote trekking areas in the Nepal Himalaya. 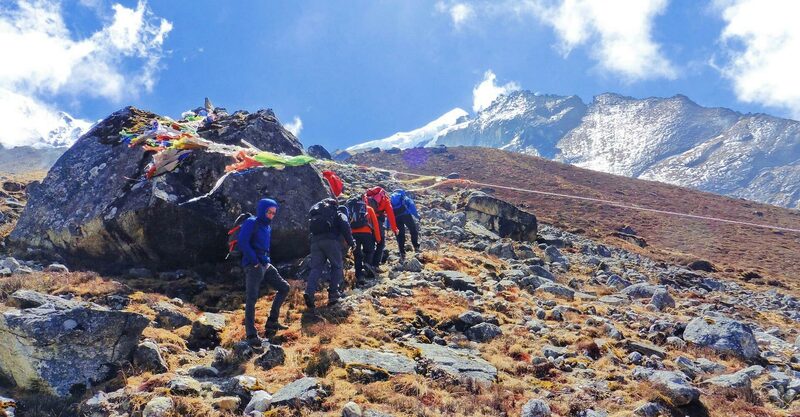 This route takes you from the south-eastern corner of Nepal at altitude of just 70 m. to the base camp of this, one of the greatest mountain masses in the world. It is one of Nepal’s least trekked areas and certainly one of its most beautiful., from Kathmandu you fly to Taplejung via Biratnagar and commence trekking up Tamur valley along one of the oldest trade routes in the Himalaya. Walking through lush rhododendron forests you climb on into high alpine terrain beyond the village of Gunsa. A camp established high above this village that provides astounding views of Kanchenjunga’s South face. 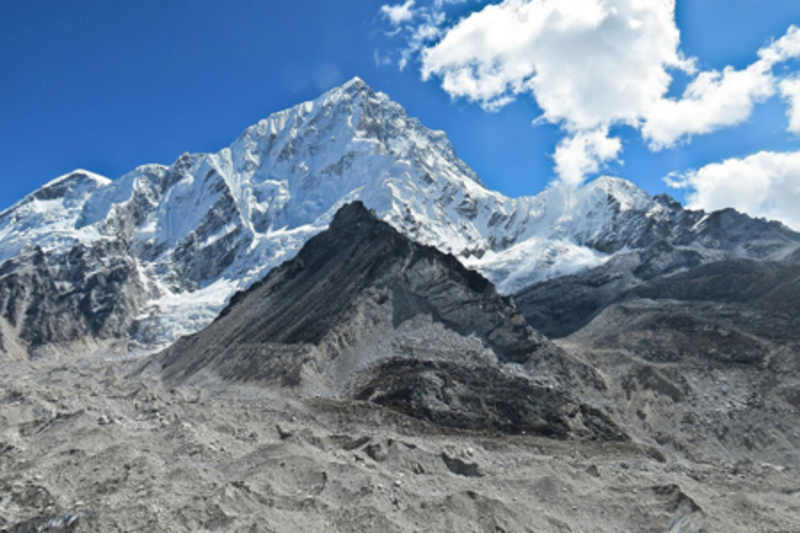 Returning to Gunsa you then cross the Lapsung La pass and trek on the Yalung Glacier and Kanchenjunga Base Camp. This really is still exploratory trekking and you must be prepared to take the trail as it comes. But to look up at Kanchenjuga towering south face is easily reward enough for your efforts. 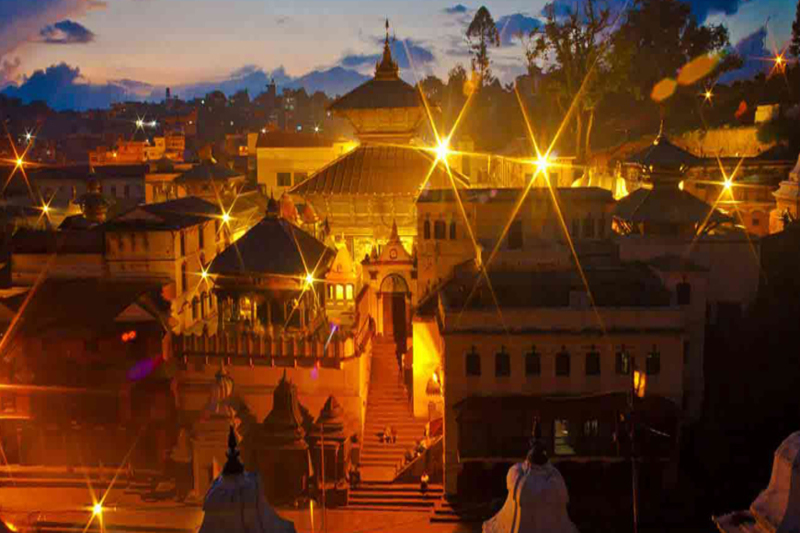 Retracing your route to Taplejung you return to Kathmandu, having becomes one of few who have experienced this remarkable and little known region of Nepal. Nepal Mustang Trekking For the Mustang trek we take a morning flight to Jomsom, the district headquarters of Mustang. The sound of jingling horse and pony bells as the Mustangi people pass by with their loads becomes an omnipresent aspect of the trek from now on. We trek up the windy Kali Gandaki valley to Kagbeni. The wide trail along a sandy, saligram-filled riverbed provides views of the surrounding peaks of Dhaulagiri, Tukuche and Nilgiri, and to the south the entire Annapurna Massif. Kagbeni, spectacularly situated atop a cliff overlooking the confluence of the Kali Gandaki and the Jhong Khola rivers, is the last village in Lower Mustang and guards the entrance into Upper Mustang, visible across the Kali Gandaki riverbed. It is an oasis of patchwork fields in the midst of rocky, arid mountains. 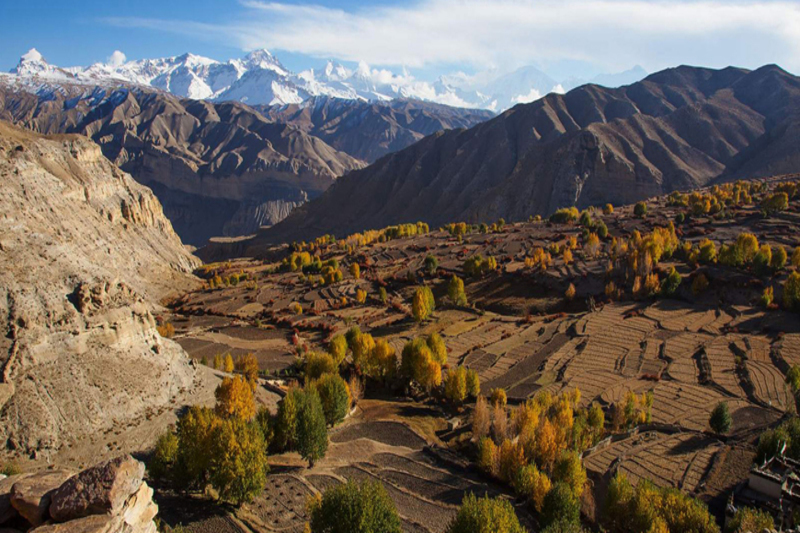 This ancient and partially ruined citadel town provides us with a taste of scenes to come in upper Mustang, with its narrow alleyways and tunnels, irrigation canals, green fields of wheat and barley and its imposing and newly-restored brick-colored gompa. Here we go through the police check, after completing our paperworkwe enter Upper Mustang, the long-forbidden region of Nepal. The Bumthang Owl Trek offers an invigorating experience of the culture and environment of the country. It is a moderate 3 day hiking route which starts from Menchugang and ends in Jakar Dzong. The trail has an abundance of flora and fauna, and the panoramic views of the valleys beneath the hill tops and the Himalayas spread over a broad horizon would be an experience that one shall cherish for a lifetime. This trek could be a substitute for the Bumthang Cultural Trek that has been deteriorated to a great degree by the farm road constructions. others. 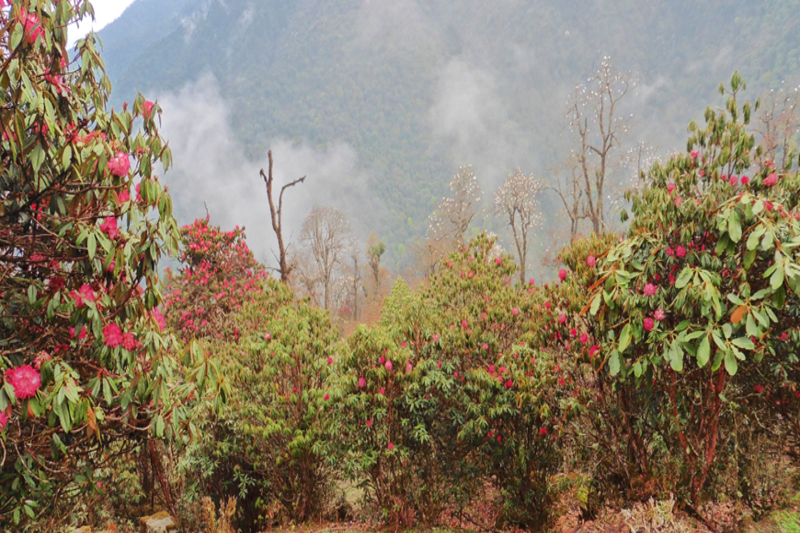 In spring the rhododendrons flowers are in bloom that beautifies the whole trek route. 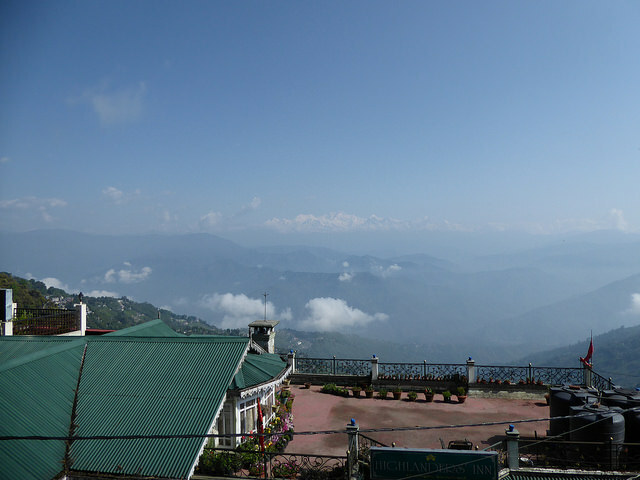 -The valley views and the Himalayan snow capped mountains in the north. -Birds of different spices, among them the big monal pheasants can be sighted around the second camp and Tharpaling area during mornings and evenings. -The Monastry life in Tharpaling, Choedak and Zhambala are yet very interesting. Nabji-Korphu -based Nature Tourism Trek"
Open from October up to the end of March. The trail goes through the Jigme Singye Wangchuck National Park located in central Bhutan, in an ecological rich environment. The park is also home to several cultural rich agricultural villages. The trail is a six-day low-altitude trek (between 693 m./23,100 ft and 1,636 m./5,453 ft) through six different villages located inside the park. Starting point Riotala (1,060 m./3,533 ft) and final destination Tongtongphey (1,061 m./3,537 ft) are two small villages along the Trongsa-Zhemgang road, situated in the buffer area of the park at the east side of the Mangde Chhu (river). On this trek, you will possibly see the Golden Langur (Trachypithecus geei), one of the rarest primates, which can only be found in Bhutan and neighbouring Assam. Jigme Singye Wangchuck National Park is also home to the endangered Rufous-necked Hornbill (Aceros nepalensis). In addition to this, the trail is a superb place for birding (common mynas, blue-fronted redstarts, long-tailed shrikes and Eurasian sparrows, to name just a few common species, but spotted are also serpent eagle, golden-throated barbet, and the yellow-bellied flowerpecker) and has a wide variety of plants and flowers found in this Himalayan area (from Chirpine, broad-leaved trees and Bamboo, to Rhododendrons and wild Orchids). Besides the natural beauty of the area, the area also contains cultural history, witnessed among others by the presence of a commemorative pillar in the temple of Nabji. The pillar symbolises the occasion that peace was negotiated between the two kings (King Nauche from India and King Sindu from Bhutan) intermediated by Guru Rimpoche in the eight century. Along the six day trail more traces of Guru Rimpoche’s presence during his visit to Bhutan in the 8th century can be found. The last two days of the trek will go through the homeland of the Monpa people. The small traditional villages of the Monpa community are scattered on the slope overlooking Mangde Chhu. The Monpas are thought to be the first settlers in Bhutan, the Mangde Chhu valley representing one of the earliest areas of settlement in Bhutan. The Monpas practice a mix of animistic shamanism and Buddhism. Monpa refers to “the people of darkness” referring to their isolated position in the past. 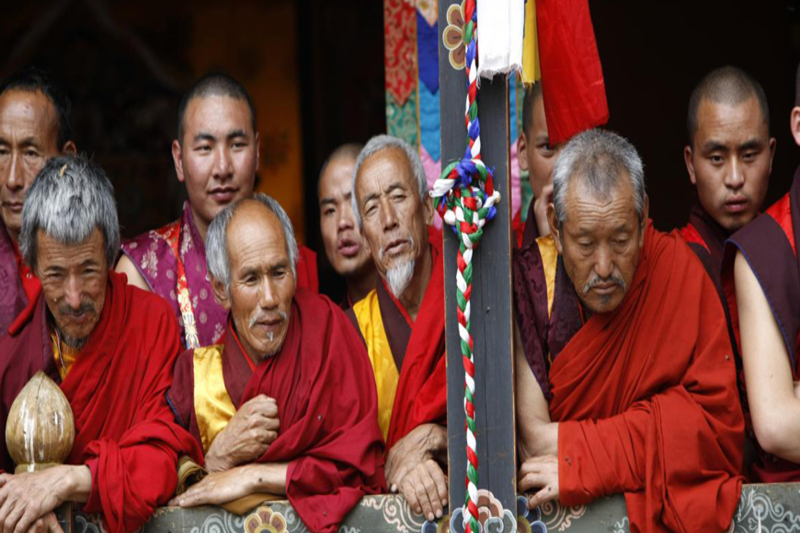 In general term Mon refers to people without religion that symbolizes period before the advent of Buddhism in Bhutan. They were originally hunters and food gatherers and their culture, tradition and practices are intrinsically linked to the forest around them. They are traditionally cane weavers and bamboo crafters, using their skills for house construction, making baskets and other household items. The Nabji Trail supports the park management in their efforts to conserve nature by creating more awareness on natural and environmental issues, through tourism awareness programmes and by introducing socio-economic benefits. 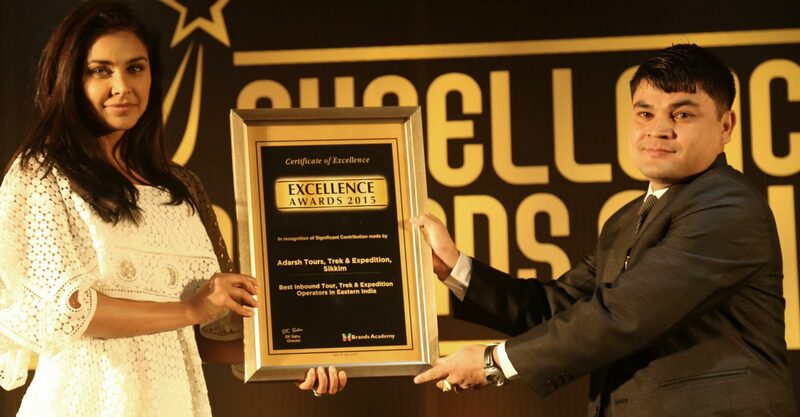 Specific measures are put in place to maximise socio-economic benefits and minimize negative impacts from tourism development to support the livelihood of the local community in the area and to create more awareness on natural, environmental, and cultural issues. 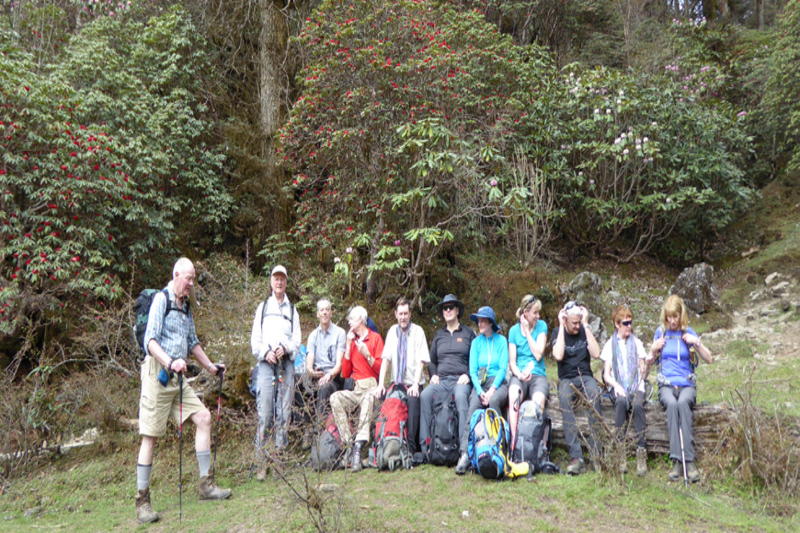 Raven Tours and Treks will offer a service package that includes campsite, porters, guides and cooks. Others services and products offered by us are a cultural program, handicraft made out of cane and bamboo, vegetables and firewood. The entire campsite will have more or less the same facilities such as camping ground, toilets, shower, kitchen and a mini theatre (two campsites) for cultural program. Jomolhari Trek I is the longer one of the two Jomolhari routes- and the most popular trek in Bhutan. With altitude differences of 2,500m. and nearly 5,000m. (lowest and highest point of the route), it offers a wide range of landscape ,fauna and flora. The highlight of this trek is the spectacular view of Mount Jomolhari from Jomolhari Basecamp, Jangothang. Nearly the whole trek goes through a small part of the Jigme Singye National Park, passing a few of the Yak herder’s settlement and the remotest region of Lingshi. One should be reasonably physically fit to enjoy the majestic mountain views, endure thin air, serenity & the wilderness of the landscape while on the trek. Moderate to Strenuous trekking and camping between 2800m/8185ft and 4,150m/13,615ft with hikes to 4,500m/14,760ft. Hiking daily between 5/8 hours in mountain trails in varied conditions involving frequent accents and descents. 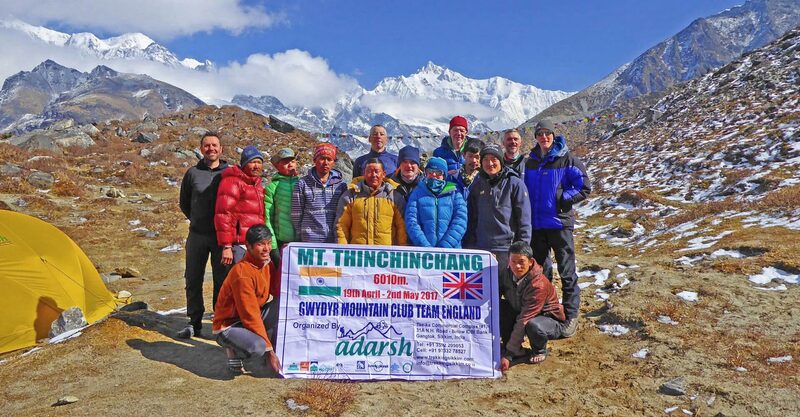 Fully supported trek with cook, helpers, all meals and camping equipment led by experienced local guides. All equipment and luggage will be carried by ponies with pony-men. Clients carry a light daypack (back pack) only and walk at your own pace. Jomolhari Trek II is the shorter one of the two Jomolhari routes the most popular trek in Bhutan. With altitude differences of 2,500m and nearly 5,000m (lowest and highest point of the route) it offers a wide range of landscape and fauna and flora. The highlight of this trek is the spectacular view of Mount Jomolhari from Jomolhari Basecamp in Jangothang. Moderate to Strenuous trekking and camping between 2,800m/8,185ft and 4,150m/13,615ft with hikes to 4,500m/14,760ft. Hiking daily between 5/8 hours in mountain trails in varied conditions involving frequent accents and descents. 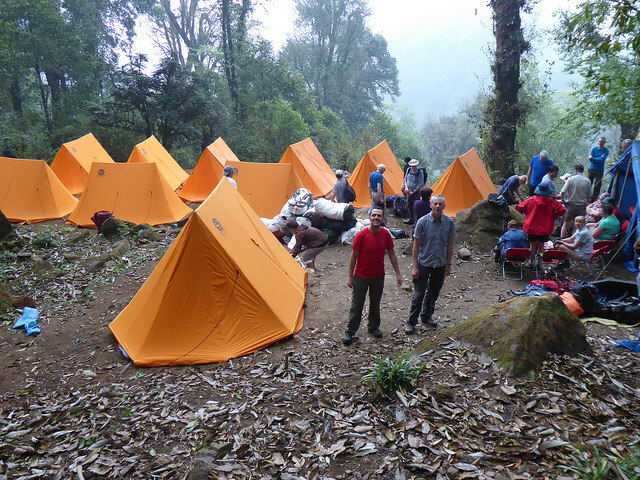 Fully supported trek with cook, helpers, all meals and camping equipment led by experienced local guides. All equipment and luggage will be carried by ponies with pony-men. Clients carry a light daypack (back pack) only and walk at your own pace. 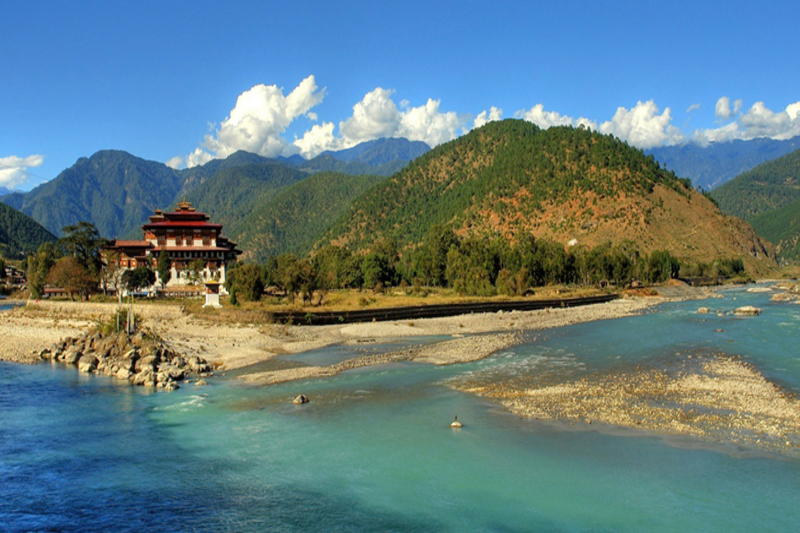 There are two fascinating villages in north eastern Bhutan. The culture and tradition of the people living there are different in many ways and respects from rest of the Bhutanese people. They have a very rich culture heritage. They live on animals like yaks, sheep, cows and horses. They move from place to place with animals with the change of seasons. They are known as ‘Brogpas’, which means ‘herdsmen’ or they are semi-nomadic tribesmen. 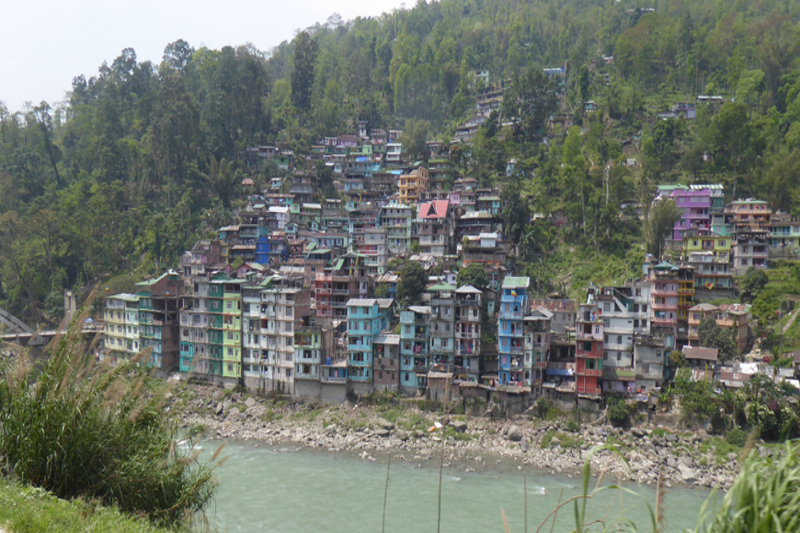 These two villages are called ‘Merak & Sakteng’. In doing this trek, we will be able to explore ourselves their indigenous culture of this tribesmen, not only having seen them personally. Come and visit before it is too late to see their indigenous culture and traditions. 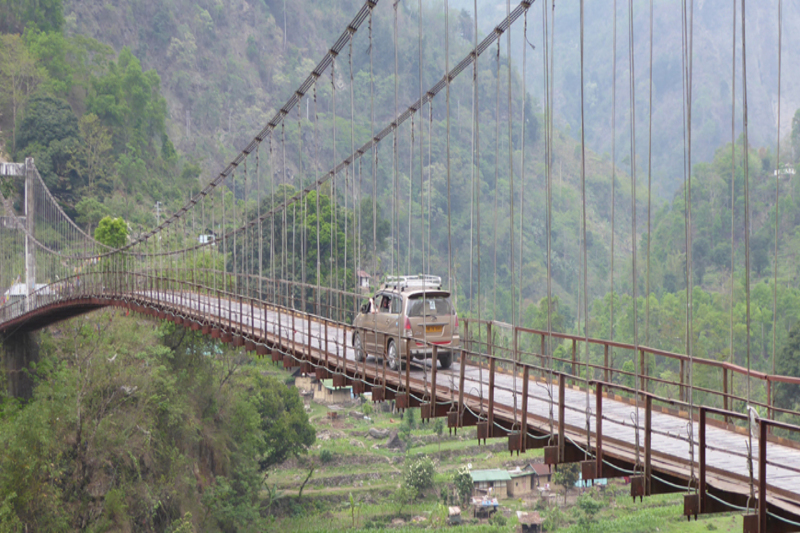 This route was the most important trade route to eastern Bhutan till the road was built. Nowadays hardly anybody, except some ardent trekkers, travels along this route anymore. The route can also be seen as an extension of the Snowman Trek ending in Bumthang. 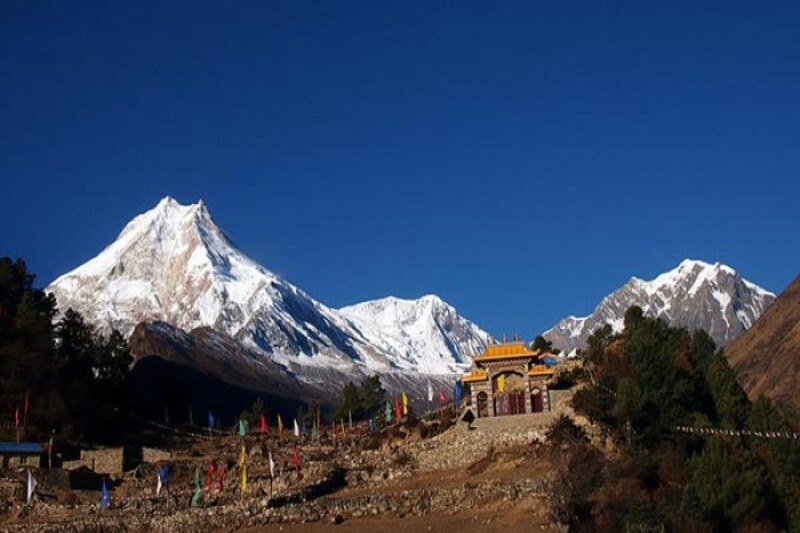 The combination of the two of them, Snowman and Rodung La trek, connects the country from the west (Paro) to the far East (Trashi Yangtse). Although the trek does not lead into really high altitude, it is tough and involves long steep descents or ascents, depending on the side you start the trek. Definitely one of the harder treks in Bhutan! Sikkim - Adventure Tour Darjeeling, popularly known as a jewel in the crown of the east Himalayas, has been destination for the nature lovers. Dotted with world famous tea gardens, the hill town, though dogged by water scarcity, is being frequented by foreign tourists for a joy ride on its toy train run by Darjeeling Himalayas railway that has been awarded world heritage status by UNESCO. Some call it “ paradise for shopping and a kaleidoscope of Indian, Chinese and Tibetan cultures, and no tourists would miss the sunrise over Mt Everest and the Kanchendzonga. 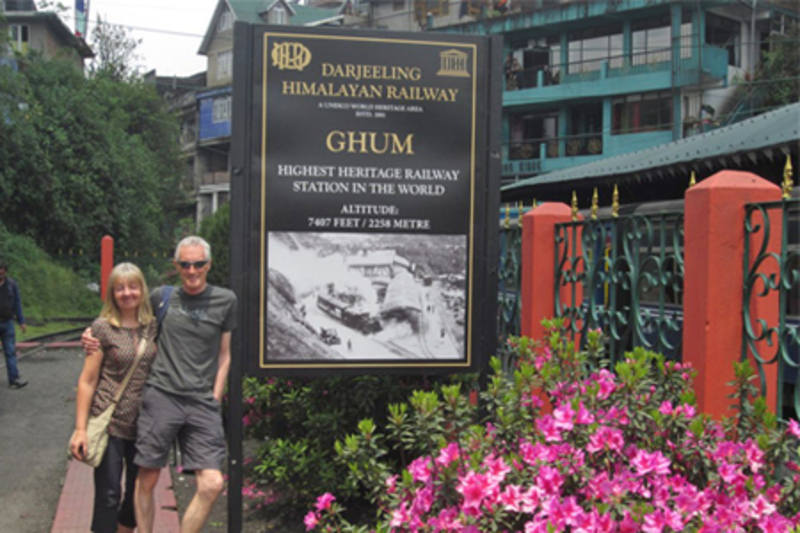 There are many more major attractions to see around Darjeeling. Sikkim - Bird Watching Tour"
Sikkim Himalayan homestay is an unforgettable experience and a great way to explore local culture and make new friends. 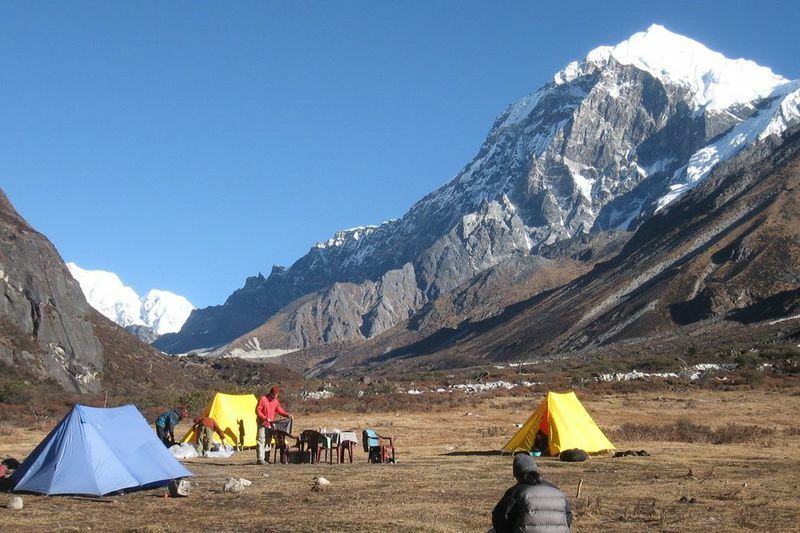 Homestay of trekking is new concept of tourism in Sikkim and it is becoming more and more popular as it provide more opportunities to the trekkers to know and experience the local culture and life style and this type of trekking is economically cheaper comparatively with other type of trekking like camping trekking. Guests in the Himalayan homestay program stay with village families and eat meals prepared by the family, local villagers serve as guides so that guests can experience village life one-on-one. Cultural programs such as dances and singing can be organized to highlight local cultures and traditions. Homestay operators strive to make visitors comfortable in every way. However you should keep the following points in mind to make your stay as enjoyable as possible. Homestay hosts are trained to provide food and drinking water in a hygienic and palatable manner. Drinking water is boiled. However, should you have special dietary requirements, please let the homestay operator know in advance. Guest will be served traditional village foods unless they request otherwise. All homestay operators have been trained to provide clean furnishing and bed linens. If you require extra blankets or other items, your host will be happy to provide them. Many guests are apprehensive about the toilets facilities they will find in homestay. All homestay operators have been trained to clean and maintain toilets so that they are acceptable to guests. Some homes have western-style toilets, however please keep in mind that many do not. Homestay operators will provide toilet paper for guests. The most important thing is to communicate your needs to the homestay operators and to remain flexible : villagers are as eager to learn about your life and your culture as you are about theirs. Homeland to the Lepchas Rugged community,the original inhabitants of Sikkim. 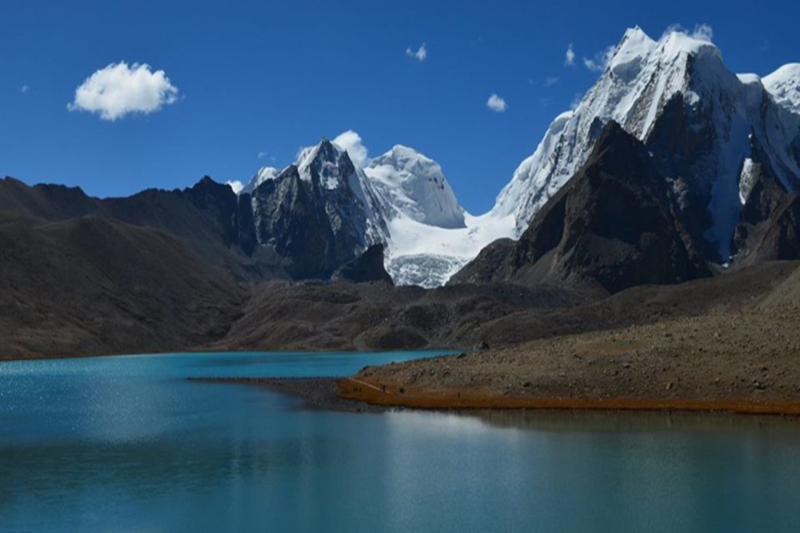 It borders the Khanchendzonga Biosphere Reserve and offers panoramic views of Mount Khanchendzonga (8,585m), the third highest summit in the world and the protective deity of Sikkim/Dzongu remote valleys and rocky peaks are home to rare fauna and flora that are endemic to the area. Dzongu is about 70km north of Gangtok and is 2 hours drive by jeep. This picturesque valley was formed by fast flowing glacier-fed rivers emerging from the Himalayas. The Lepcha people of this site are primarily animists and Buddhists. The area is very remote, and is surrounded by sharply titled verdant mountains that are stacked on top of each other at a forbidding angle. Many of the village trails pass through gorgeous, pristine forest dripping with mass and orchids. 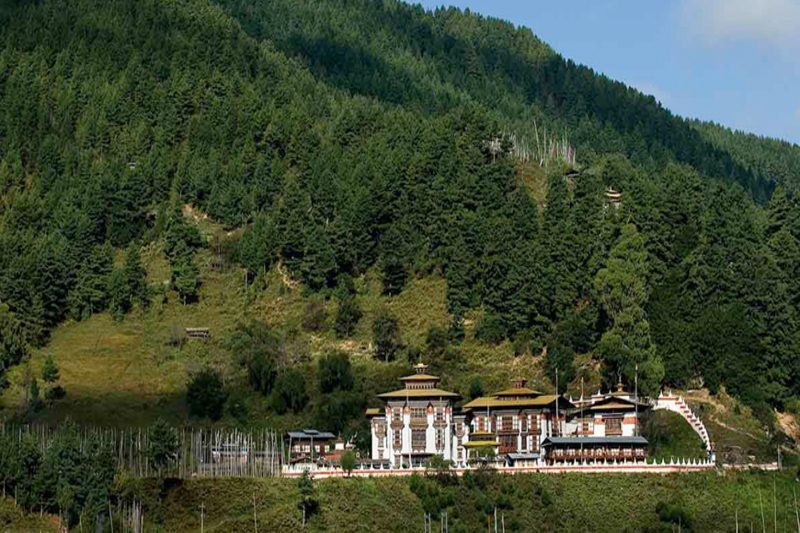 Because of the altitude variation of Dzongu, visitors can see warm sub tropical forests, temperate deciduous forests, and alpine zones in the higher ridges. The people of Dzongu are mostly engaged in subsistence farming and are very warm and friendly. Activities of Dzongu can include invigorating walks in upper and lower Dzongu to experience the thrill of crossing cane and bamboo bridges that pass over churning rivers. 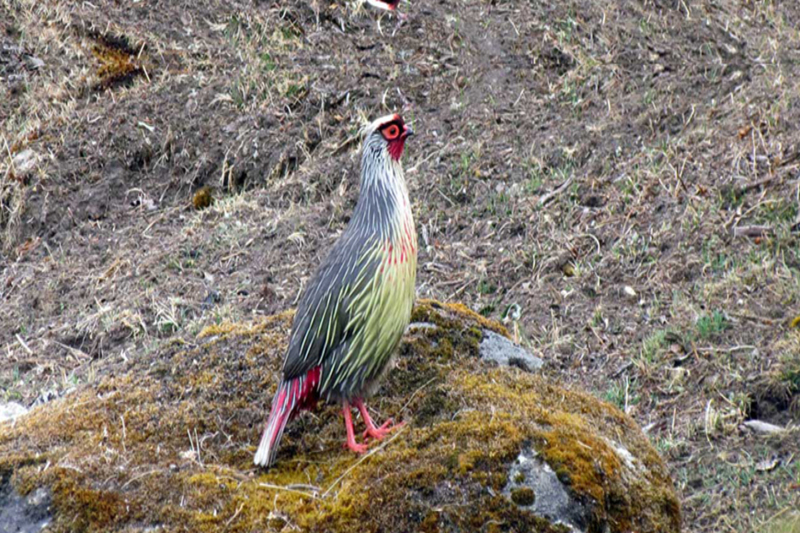 Birds watchers will delight at the rare and beautiful birds of Dzongu. Thundering water falls and dense pristine vegetation make Dzongu ideal for botanical chortens at its entrance and prayer flags circle the shrines. Every three years an important religious festival is held at Tholung Gumpa. Please note that visitors to Dzongu must obtain a Restricted Area permit to visit this region. You must allow a few days to make these arrangements. A Traditional Bhutia Village Kewzing is a quite, traditional Bhutia village 8km from Ravangla in South Sikkim. The Kewzing Tourism Department Committee (KTDC) is a local community based organization that was formed to develop and promote responsible tourism in the area. Kewzing village offers magnificent mountain views and is an ideal place to experience the traditional Bhutia (Buddhist) way of life. KTDC makes arrangements for accommodation, meals and guided walks and can also organize cultural activities on request. 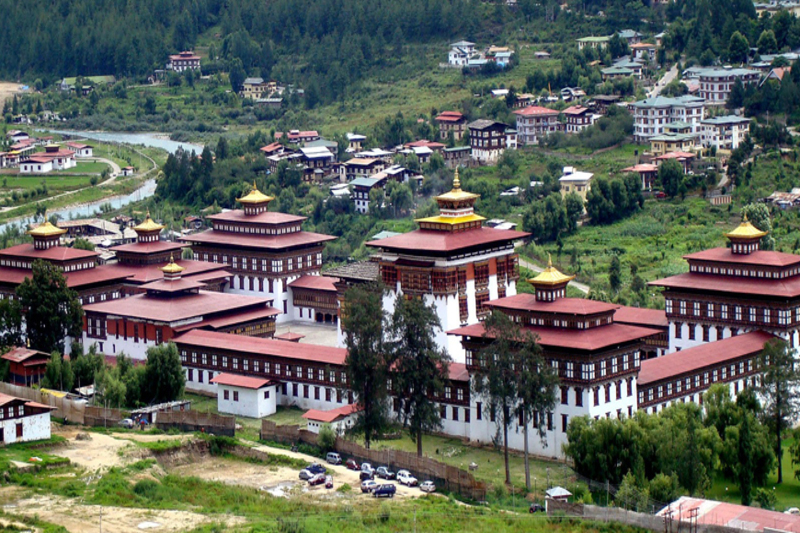 Activities during your stay can include village hikes, and visits to the Bon, Doling and Mangbrue monasteries in the area. Nature walks pass through cardamom plantations, which are an ideal habitat for the rich diversity of birds found in the Kewzing area. 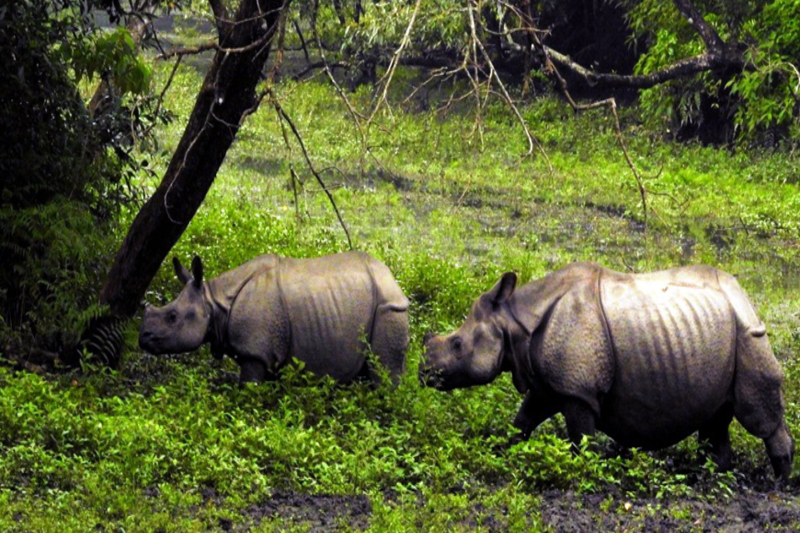 The more adventurous can take an overnight trek to the remote and rarely visited Maenam wild life Sanctuary (3,200m) for a spectacular view of the mountain and the plains of North Bengal. We can also arrange sightseeing tours to Samdruptse (an enormous statue of the patron saint of Sikkim), Ralang monastery, Temi tea garden, a traditional paper-making factory, Rayong Sunrise point, or a fun-filled picnic day to the Rangit water world (a River Lake in the Rangit river). 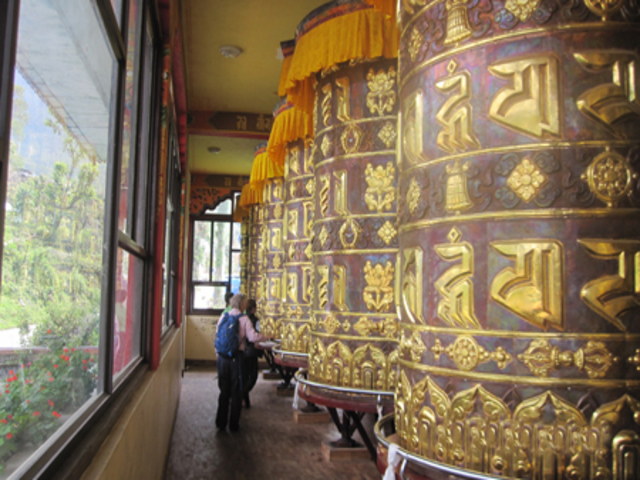 Tashiding and Pemayangtse monasteries, Pelling, and Khecheopalri Lake in west Sikkim are also accessible from Kewzing. Something for Everyone The idyllic village of Pastenga is located less than 70 minutes drive from Gangtok, yet it seems a world away. The village is an ideal retreat for anyone who would like to experience a sampling of traditional Sikkimese village life. Pastenga is the home to a unique community of animist Nepalis known as Kirat Rai as well as Bhutias and Lepchas. The rich farmland that surrounds the village has supported these diverse communities for hundred of years. The name Pastenga comes from the fact that many types of bamboo thrive in the forests that surround the village. The villagers of Pastenga have a particular use for each of bamboo. Visitors to Pastenga will be able to see traditional Bhutia and Rai houses that have remained virtually unchanged for 150 years, walk through cardamom plantations to visit a sacred waterfall, and observe daily village life. Guests can also enjoy a cultural show, which features Bhutia and Rai dancing and singing, and sample the delicious cuisine of the area. The village also features an help garden that contains medicinal plants common in the area. More adventurous visitors can leave from Pastenga to undertake a trek to Khedi, a remote site several days walk from Pastenga. Sacred landscape. 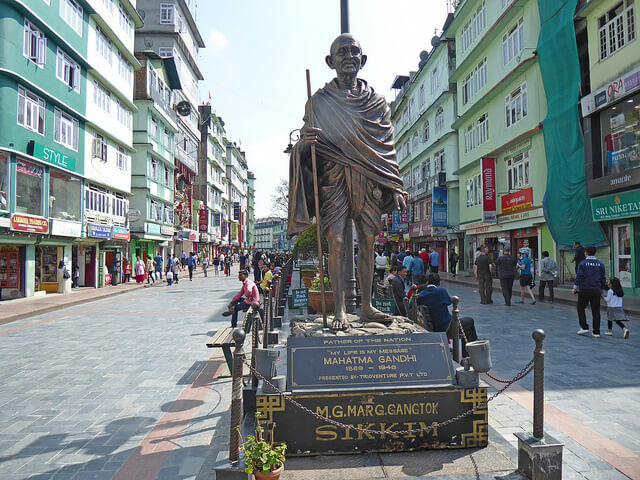 Rich History and Bio-diverstiy Hotspot Yuksum which mean meeting place of the Three learned Ones is the first capital of Sikkim. The modern history of Sikkim starts from here with the consecration of the first King of Sikkim, Phuntsok Namgyal in the year 1642. The stone coronation throne in which the first king was consecrated is still there at Narbu Gang Chorten, Dubdi monastery, located on the hill top of Yuksam is the oldest monastery of Sikkim. Yuksum village (5840ft) lies in the western part of Sikkim. It is the base for trekking to the world famous Yuksam Dzongri Trail Â which is located inside the Khangchendzonga National Park. The whole area from Yuksam to Mt. 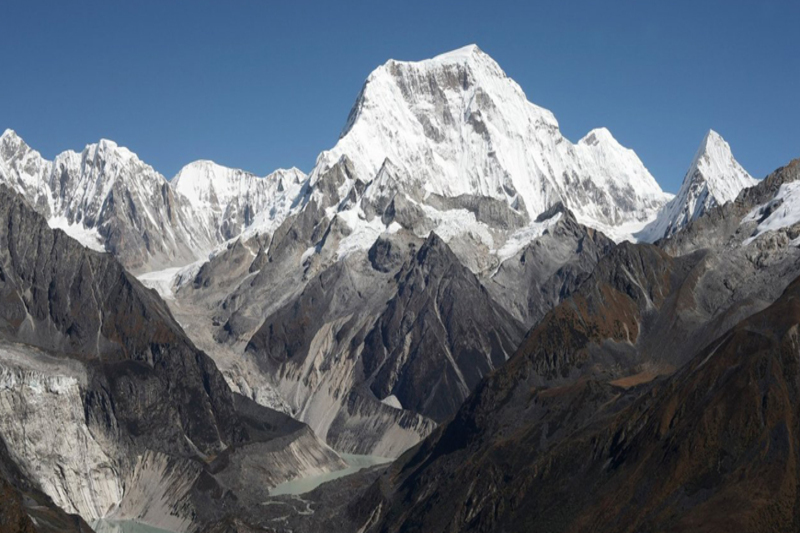 Khangchendzonga (the third highest peak in the world) is not only rich with biodiversity but it also considered as a Sacred landscape Here one can experience diverse vegetation types. The area surrounding Yuksum is truly a Birders Paradise having more than 250 birds species, 18 Species of Rhododendron, many species of medical herbs, alpine flowers and rare wild Orchids. Yuksum village have diversified Ethnic community like Lepcha, Bhutia, Limboo and Nepali. 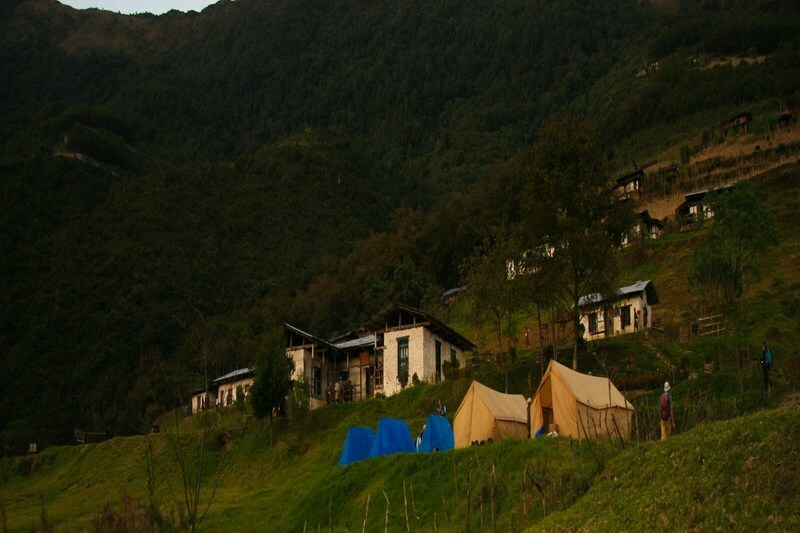 The rendezvous of culture can be experienced in the Homestay which is being promoted by ECOSS (Ecotourism and Conservation Society of Sikkim) and the local organization KCC. Yuksum is approximately 125 km from Gangtok. Many other important sites in west Sikkim including Khecheopalri lake, Pemayangtse monastery, Tashiding monastery, Hongri monastery and Khandu Shangphu hotspring, can be easily reached from Yuksum. Sikkim - Mountain Jeep Safari"
Nepal has several ancient pilgrimage sites. Each temple is attached to a legend that glorifies the miraculous powers of its deity. 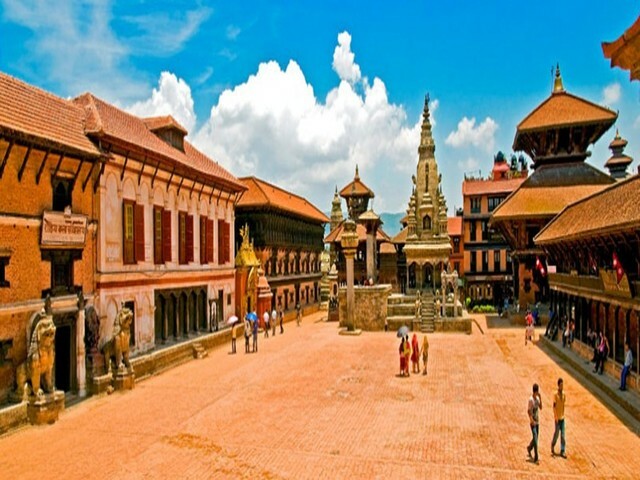 There are many pilgrimage sites in Nepal, such as Pashupatinath Temple, Swayambhunath Stupa, Barah Chhetra, Gosainkunda ,Pathibhara, Tengboche; Manakaman, Gorkha, Lumbini, Muktinath, Halesi Mahadev, Janakpur, Tansen, and Swargadwari, Khaptad Ashram ect. Nepal is also the Gateway to Kailash Mansarovar, the mythical abode of Lord Shiva. Devotees from various parts of Nepal and India throng the temples during special festivals. Pilgrimage sites of Nepal like Muktinath and Gosainkunda make popular trekking destinations. Muktinath is a pilgrimage centre for Buddhists and Hindus. You'll see Tibetan traders as well as sadhus from the far south of India. The shrines in a grove of trees include a Buddhist gompa and a Vishnu temple of Jiwala Mayi. 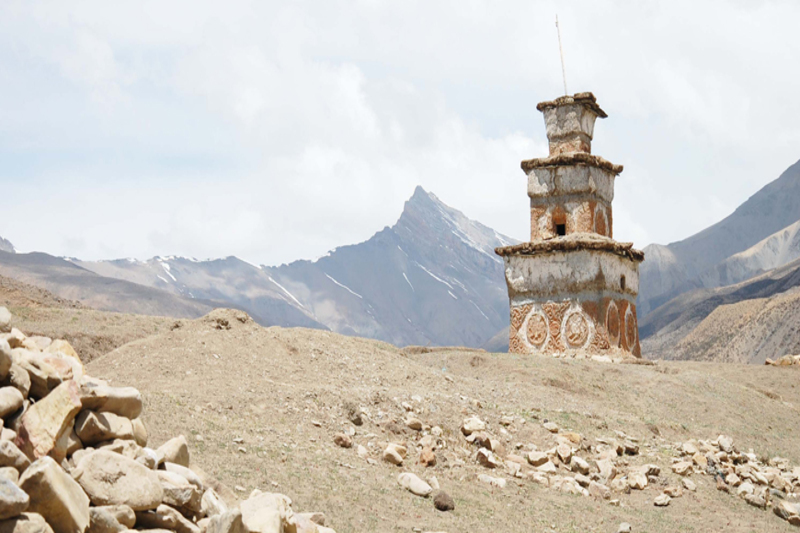 An old temple nearby shelters a spring and natural gas jets which provide Muktinath's famous eternal flame. It's the earth-water-fire combination that accounts for Muktinath's great religious significance. From Muktinath you can retrace your steps to Pokhara, or simply to Jomsom and hope to catch a flight from there. It is possible to continue beyond Muktinath and cross the Thorung La pass to walk the rest of the Annapurna Circuit but this long walk is better made in the opposite direction. 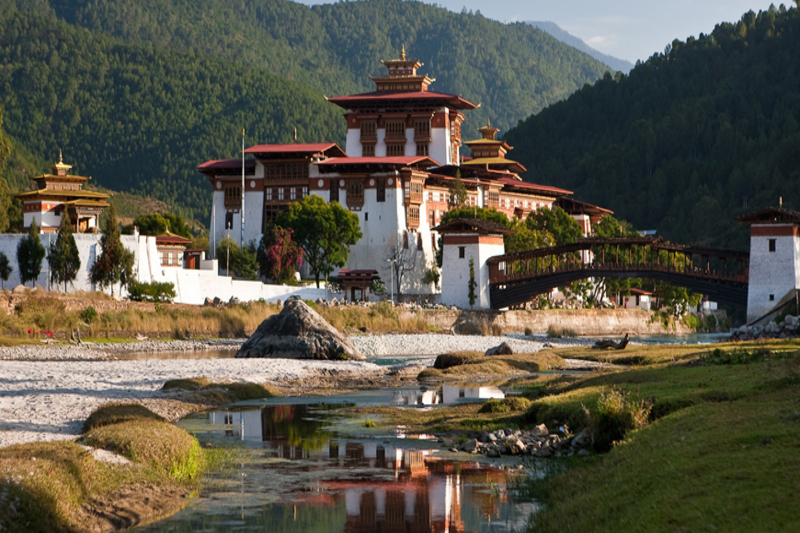 5 Day Glimpses of Bhutan"
Wild East West Trip to Bhutan"
Customize and book theme based amazing holiday packages and adventures trips to best destination. Select the tour package you like and tell us your preferences. Get quotation from our travel experts designed as per your interests. Mt. Thinchenkhan (6,010 M.) - Expedition Mt. Thinchenkhang (6010 Mts) is situated in western Sikkim and falls under Kanchenjunga National Park which is window to natural beauties, bio- diversity, sacred lakes and snow capped mountains. One can see this peak from Okhlathang Valley while trekking to Goecha La (pass). This peak has been declared by Sikkim Govt. as trekking peaks in 1990. Since then it had caught the eyes of many mountaineers, but it has only been appreciated much then climbed. Mt. Jupono Climbing 5605 m.
Mount Jopuno is situated in the western part of Sikkim at a soaring elevation of 5603 meters. This imposing peak lies under the Kanchenjunga National Park. While trekking towards the Goecha La Pass, this spectacular peak is clearly visible from the Okhlathang valley. It is one of the primary attraction for the mountaineers or peak climbers from all over the world after it was recently opened by Government of Sikkim. During this Expedition the trekkers and adventure lovers can enjoy the most captivating scenes of some highly mesmerizing peaks of the Sikkim Himalayas. 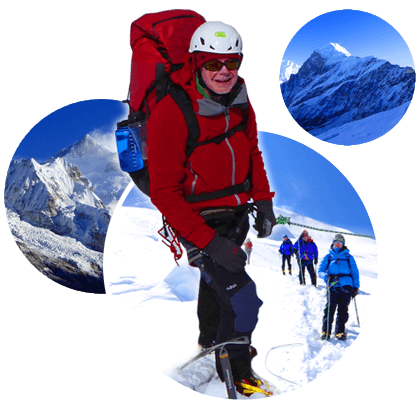 Trekking to Mount Jopuno also offers the climbers to explore pristine beautiful places like Goechala, Dzongri, Dzongri la and other Alpine valleys which are very famous for Adventure Trekking. These integral places are famous for their supreme serenity as well as paramount exquisiteness. The exotic trip takes the trekkers to the hair- rousing and a comprehensive trek to the great Mount Jopuno. The exotic tour is absolutely ideal for the trekkers who have an inclination towards the nature's magnificence along with those trekkers who want to satiate their need for contentment in the midst of the virgin ambiance of this peak. Mt. Frey Peak Climbing 5,830mts An exquisite peak in close proximity to Rathong Glacier, Frey Peak lies near the Kabru sister of peaks boasting two imposing summits i.e. Kokthang and Rathong Peak. The trek involves passing through the absorbing Frey Glacier. The trail is mostly rocky and includes snow in the gaps. 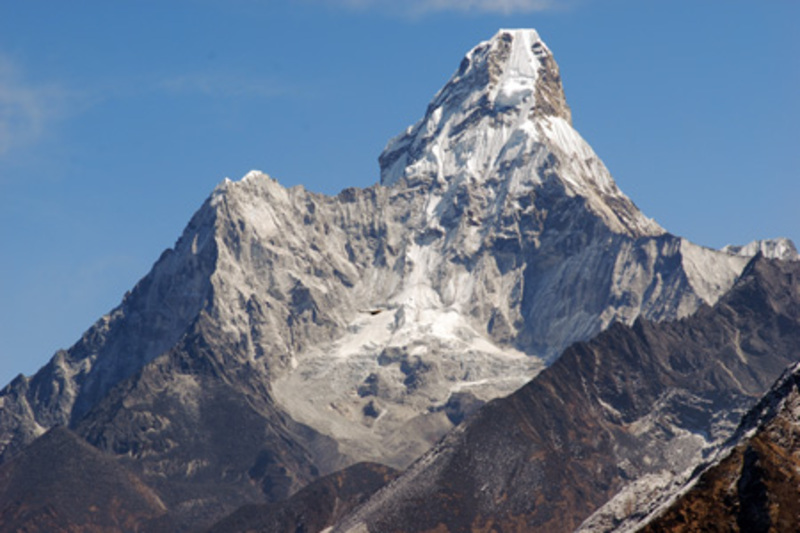 The summit is named after the renowned mountaineer George Frey who attempted climbing the peak with Tenzing Norgey. The axe and crampons are still present at the base of the peak as a memorial. The trail offers a stunning landscape and allows the trekkers to relish the undulating beauty of nature. This 14 nights and 15 days itinerary takes the travelers to Frey Peak Expedition in a comprehensive and gratifying manner. Through this tour, the trekkers can test their endurance and explore gripping regions like Tshoka, Yuksom, Chaurikhang and many more.